By Danny Emerman (Sports Correspondent). 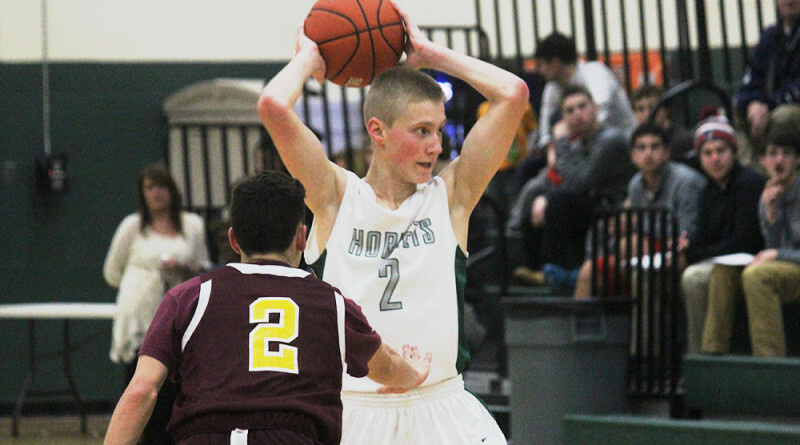 As the clock ticked under a minute, Mansfield’s Matt Ehrlich floated a layup over the outstretched arms of Peter Banks to push the Hornet lead to 10 points, essentially sealing the game. Ehrlich, the junior forward, finished with a game-high 16 points in the 51-39 Mansfield victory. The game was sloppy, full of traveling violations, turnovers, and clanked three-pointers. “In the beginning, I don’t think our effort was the problem, we didn’t shoot the ball well,” Coach Ferguson said. The score after the first quarter was 5-4 in favor of Mansfield. The defensive struggle amounted to a combined 0/12 shooting from deep in the first period. “There’s a big difference between starting flat with no energy and missing shots. We’ve been in a little bit of a funk shooting the ball, but we’ll get that fixed. We have good shooters and the more repetitions we get, the better we’ll shoot,” he added. Sharon proved their shooting woes by shooting an abysmal 2/18 (11%) from behind the arc. Coach Ferguson attributes the slow start and shooting struggles to early season nerves. “The effort was there, no doubt. The hard work was there. We just need to work on communication and hitting shots,” Lowerre said. Sharon came out of the locker room in the second half down 7 points, but they picked up the defensive intensity, forcing four traveling violations in a row. On the offensive end, junior point guard Ricardo Ripley came alive after struggling with turnovers in the first half. “In the first half, I settled for a few threes but my shot wasn’t going down, so I decided to attack more and after I got hot, I kept attacking to see what I could do for the team,” Ripley said. Normally a pass-first guard, Ripley was in attack mode in the second half, looking to create his own shot by aggressively driving to the basket. He scored all 11 of his points in the second half. As the Eagles put the loss behind them, they look ahead to Friday, their home opener versus the Hockomock rival Stoughton Black Knights.